A time tracking app is an essential time management tool that can help you and your team become more organized, efficient, and get more things done. Simply put, a time tracking app will save you and your company precious time - and money. The thing is - there are hundreds of time tracking apps available with countless features. Productivity monitoring, GPS tracking, invoicing - the list goes on and on. However, the question is: which tool is the best for you and your team? The answer - it depends. We did the research for you and collected the best time tracking apps in one place, so you can choose the right one for you - whether you're a freelancer, small business owner, or run a large company. This ultimate guide for time tracking apps has it all - time trackers with the most basic features, as well as highly advanced software. Be sure you'll find the productivity tracking software that best fits your needs. 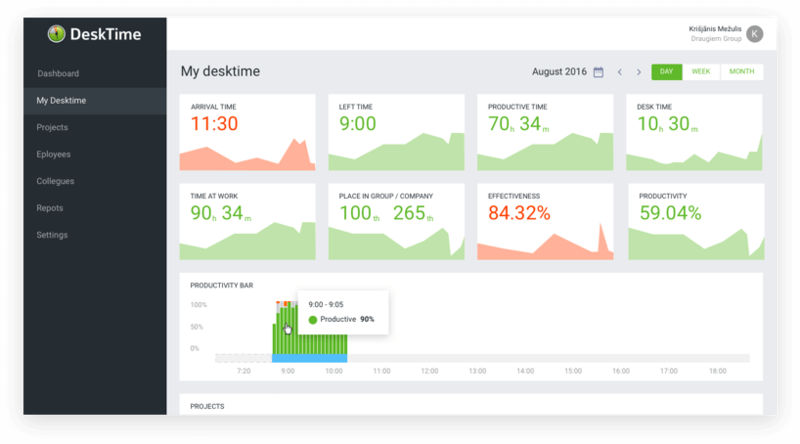 DeskTime is a simple-to-use time tracking app that combines three crucial features - employee monitoring, project management and productivity analysis. 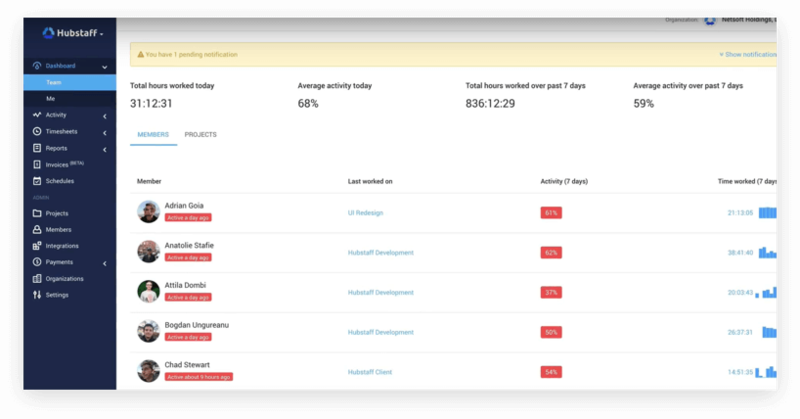 Additionally, this employee productivity tracking software is designed to help managers and their teams identify their unproductive habits, by sorting web pages and applications into "Productive" and "Unproductive". DeskTime not only tracks time, but also automatically calculates your daily productivity and efficiency based on your categorization of URLs, programs, and apps. This means - the more time you spend on productive applications, the higher your daily productivity is. Of course, the productivity or un-productivity of URLs depend on each user's position. That's why DeskTime allows you to create employee groups and manage application productivity individually for every group. That way, you can set Facebook as productive for your marketing team, while unproductive for everyone else. 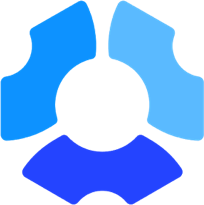 DeskTime is the perfect time tracker app for companies and teams that are more interested in the big picture rather than detailed analysis of the URLs and programs their employees use. Set the productivity target (e.g., the average monthly productivity must be 85%), then watch your employees hit the target. Detailed visual and downloadable reports. Integrations with project management apps. DeskTime is one of the best time tracking apps. In addition to time tracker, it’s a productivity tracker where employee productivity and efficiency is calculated smartly. In addition, it does not require much configuration. When there is a lot of different activity, DeskTime productivity tracker may become a bit difficult as managing what is / isn't productive can be cumbersome. 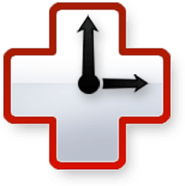 Hours is a time clock app with basic time tracking features - most suited for people who aren't looking for advanced features. Available as a mobile app, Hours allows you to keep a running list of timers and quickly switch between your tasks. In Hours, you can manage your tasks and projects by color-coding them. That is, by applying a specific color for a task or project, you can easily differentiate between them. Also, the timeline in the app lets you quickly make adjustments in your recorded timestamps at any time. For example, if you started a task at 10:00, but forgot switch the timer until 10:15, you can adjust it by simply dragging the start time to 10:00. Hours is for you if all you need is a simple time tracker and basic report-sending functionality. Reminders to start time tracking timers. Can be used with Apple Watch. This app has the right features to help you accurately track your time and take notes on what you were doing and for whom. Because the time tracker app has no Windows or Mac version, you may sometimes forget to set the timer and click it to start. Hours is also purely a work time tracker app without any additional productivity tracker. Timecamp is a cloud-based time tracking solution where work time can be easily tracked manually by timers and automatically via the desktop app. The app enables project managers to collaborate, track billable work hours and monitor project status. It also allows to create automatic employee payroll, and send invoices to customers. In addition, it’s an employee productivity monitoring software where you can see if your employees are as productive as you need them to be during the workday. What makes Timecamp stand out among other time tracking apps is their variety of integrations with other apps - it offers more than 50 integrations with project management software (Asana, Basecamp) and help desk apps (Zendesk). That way, you can easily sync and import your already-created tasks and tickets to Timecamp, and start tracking time immediately. Timecamp is a tool for managers and organizations looking for all-in-one time tracker and billing app, as well as employee productivity tracking software that integrates with project management tools. Get your daily productivity analysis. Create and store invoices for clients. Get notifications when a client views an invoice. Timecamp is a fairly simple time tracking app with easy to understand customizable reports as well as an intuitive interface. It’s also an effective productivity tracker, as you can see your daily productivity analysis. Integrations are not always working properly. There are certain errors in the application for mobile devices, which can cause a loss of data. *Discounts to non-profits, universities, students. Time Doctor is a mix between time tracking, monitoring of employees and project management. It's a powerful employee monitoring tool, as it gives you very detailed information about your employees. The Time Doctor time tracking system records what web pages and apps each employee uses. It also allows managers to take desktop screenshots to see what their employees are working on at the exact moment and minimize the chances of slacking off. In addition to time tracking, Time Doctor allows you to pay your employees directly from the software via PayPal, Payoneer, TransferWise or any other method that you choose. The payment is automatically calculated from the hours each employee has worked. Time Doctor is a powerful employee time tracking app for both smaller and larger companies (20-500 employees) looking for an all-in-one detailed employee monitoring and employee payment software. It's a solution for small business owners and startup CEOs - paying directly from the time tracking app saves time. Create payrolls and pay your employees through the software. Give clients access to your Time Doctor account. With Time Doctor, it’s easy to maintain transparency with clients at all times. The TimeDoctor time tracking program helps to track project hours and provide documented proof of work for clients. Time Doctor is not the best time tracking app in terms of design and ease of use, as the interface looks quite outdated and sometimes it is hard to understand where to find a certain feature. Could be more intuitive. *For teams of 10+ additional discounts apply. Toggl is a timer-based time tracking system that's rather easy to use. Create a project, then create a task within the project and start the timer. Done working on the certain task? Click stop and switch the tasks. Once the project is finished, create an invoice for your client and send it without even leaving the app. Additionally, you can share your project time report in Excel, CSV or PDF with the client, so they know what they're paying for. 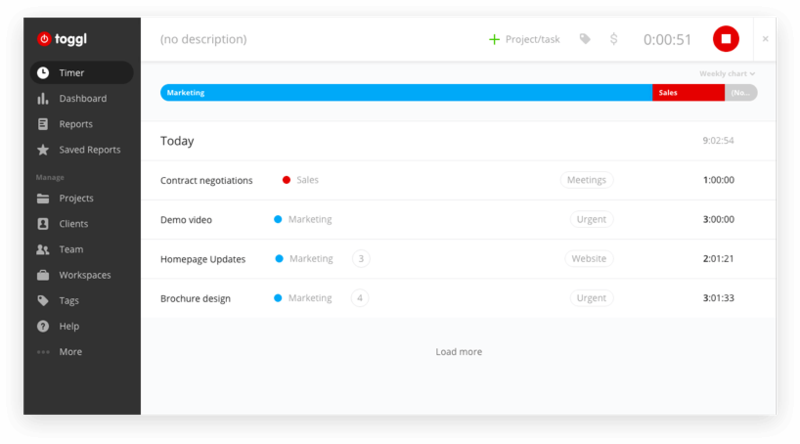 In Toggl, you can easily set up projects, assign responsibilities and create estimated timelines and budgets for each project involved. This way, you can spot immediately which of your projects is overdue and over budget, then plan your time and adjust resources accordingly. Besides, they recently created a brand new Toggl Android app that you can use with your existing Toggl account for easier time tracking and productivity boost. 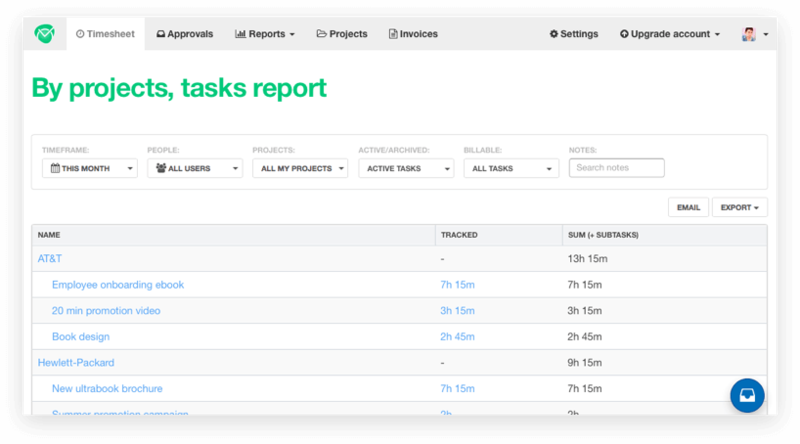 The timelines and budget planning feature make Toggl a great solution for collaborative freelancers, startups, and small businesses working on complex, limited-budget projects. Set estimated project timelines and budgets. Convenient browser extensions (Google Chrome, Mozilla Firefox). A separate Toggl Android app. Attractive and easy-to-use interface with quick access to reports and adjustment of the recorded time. 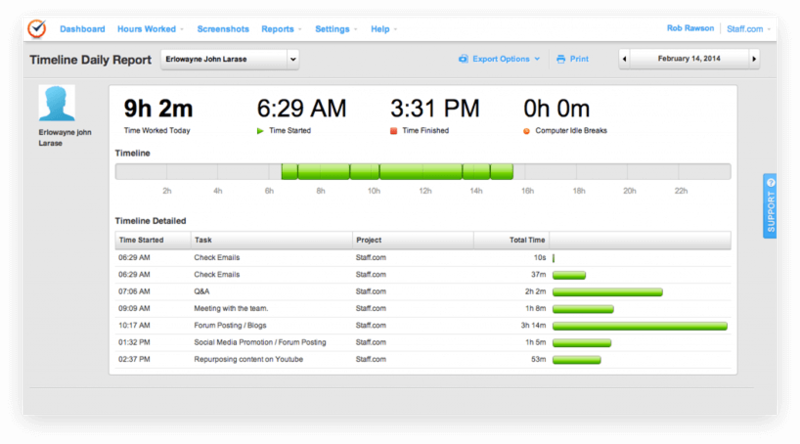 Toggl is a great employee time tracking app and project management tool. The subscription to access all features is a bit pricey. *Custom pricing suited for larger enterprises. Hubstaff, like Time Doctor, offers similar time tracking capabilities, employee monitoring and project management features. The main difference, however, is that Hubstaff lets you track time and your employees anywhere. It's a time tracking app for Windows, Mac and Linux, as well as for mobile devices, so you can keep tracking your employees even when they're on the road or out of the office. Not only does Hubstaff track time, it also tracks location with a GPS tracker. The GPS tracking feature is most commonly used by companies whose employees are frequent travelers - i.e. sales and delivery people. With an on-the-go productivity tracker, managers see where their employees are at that exact moment, how much time they spend on the road and how much they spend working on the job site. 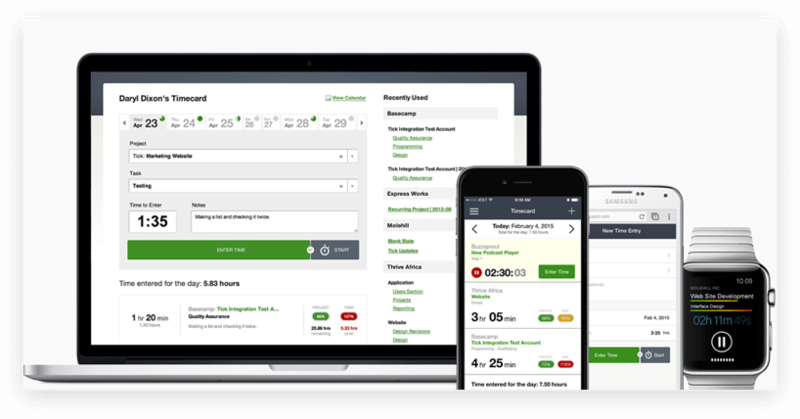 Hubstaff is an employee time tracking app for companies that employ remote workers who are often on the road. It lets managers know not only what their employees are doing, but also where they are - and if that's the place they're supposed to be. The pros of time tracking systems are simple: you know what people are working on and when! It makes your operations incredibly efficient. 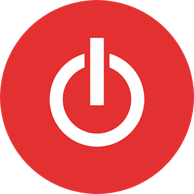 If you're looking for a platform that goes the extra mile to enable customization, atypical data entry, or a more advanced reporting structure, then Hubstaff won't be right for you. 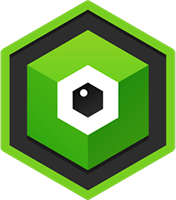 If you have an unusually large project coming up, Tick is the software to use. It's a project-based time tracking software which tracks time against your estimated project timeline and budget. For example, with each new time entry to Tick’s timesheet, the app will automatically update how much time is left for you to complete the certain task or project. The software will also notify you if the time is running out and you're about to exceed your budget or schedule. 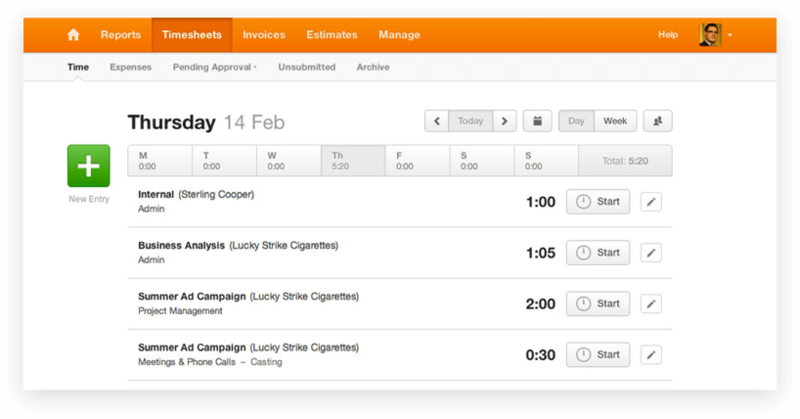 And if you have any recurring tasks, Tick also allows you to use the same budget and timeline repeatedly. If you're also looking for billing options, you can integrate Tick with an accounting software called QuickBooks to create invoices, run payroll, and more. Tick is a solution for freelancers, small businesses, and startups that work on recurring projects and tasks. 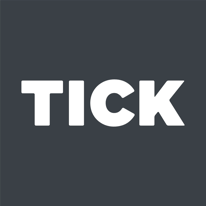 With Tick, users can track how much time they need for certain projects, and use their previous timelines to create offers for new customers. Tick tracks time against your estimated project timeline and budget. Assign team members who can add time to projects. Set recurring projects to auto-reset every month. 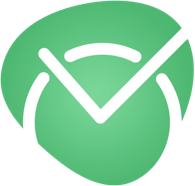 Tick is an employee time tracking app and powerful project management tool. It allows you to allocate the exact time to tasks and have a clear understanding of how many hours similar projects could take in the future. Lack of notifications to remind you that the project needs to be tracked; you always have to follow up on this yourself. RescueTime is a time tracking app that not only tracks time you spend on certain URLs, programs, and apps, but also shows you how productive you've been during the day. 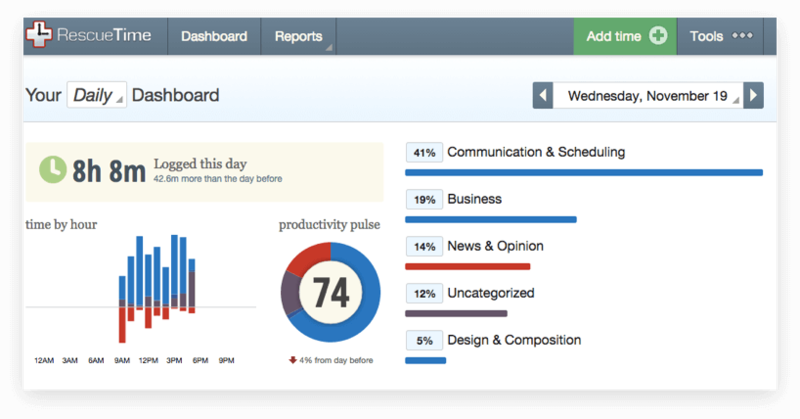 RescueTime calculates your productivity automatically based on pre-grouped categories with built-in productivity scores. For example, Facebook will by default be a distractive URL, while Microsoft Word will be seen as productive. Meanwhile, those who disagree with the RescueTime's categorization of URLs, programs and apps, can manually customize the categories according to their specific needs. Additionally, with RescueTime you can set your task goals and keep track on how you're doing. For example, you can create a list of tasks and timeline for these tasks which should keep you on track and make you more efficient. 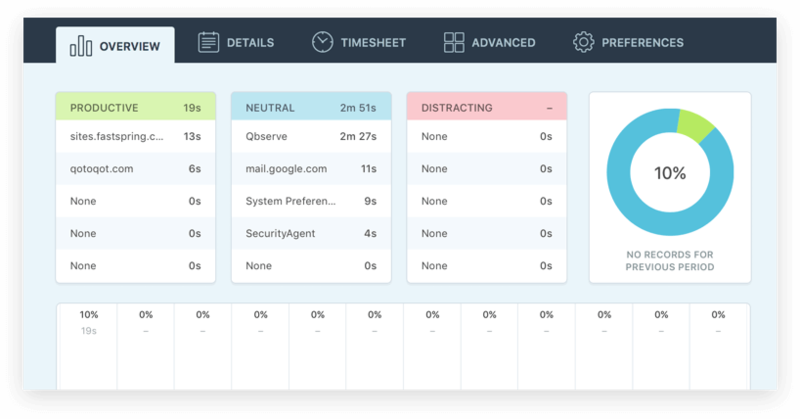 RescueTime is a productivity app for freelancers and employees looking for a personal time management tool and productivity tracker. With the goal setting and daily scheduling feature, RescueTime helps you manage your time. This app, however, won't be the best time tracking app for employers looking to monitor their team, since the app doesn't automatically send updates to managers. Receive daily productivity and efficiency analysis. Block access to distracting webpages. RescueTime is not only a time tracking app for me, but a genuine productivity tracking software. It helps me to understand how productive I am during the day and where the unproductive time is spent most of all. The productivity tracker data becomes incorrect if you don’t define all the applications as productive or disruptive. 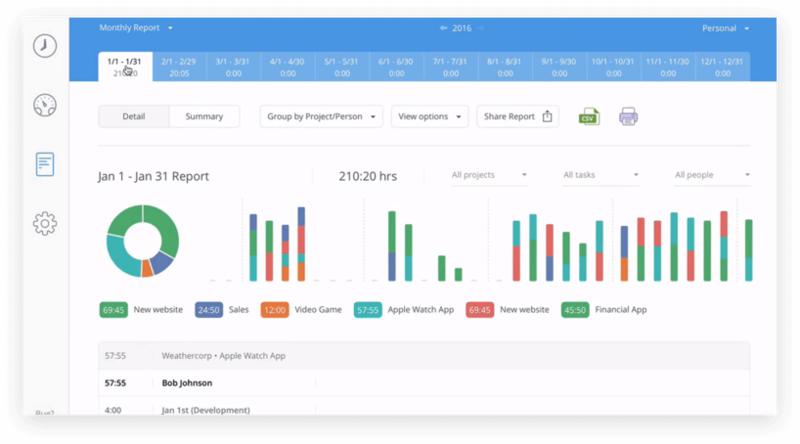 Harvest is a tracking time app and expense monitoring tool that lets you track your time spent on each project or individual tasks. It then collects the data and creates intuitive, visual reports that make it easy to see what your team has been working on and make intelligent decisions about your business. Once the task or project is done, Harvest lets you send invoices to your clients straight from the app with Stripe or PayPal. That way, you won't have to pay for additional invoicing and payment software. Also, if your client forgets to pay on time, Harvest will politely send an automatic reminder for you. Harvest not only keeps track of how you spend your time, but also keeps your invoices and revenue flow all in one place. Therefore, this app will combine work time tracker apps and expense tracking software for freelancers and startups. Automatically create invoices and receive payments from clients. Automatic reminders are sent to clients about invoices to be paid. Add comments and notes to tasks for the team. A super-simple app which manages all client payments and invoicing/reminders for our clients and integrates with Stripe for a seamless payment process. With a growing team it is hard to scale and go into the detail of the projects. The in-built feature set is quite limited. 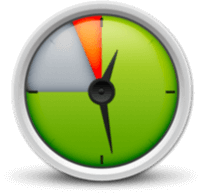 Qbserve is an automatic time tracking Mac app and productivity tracking software, especially helpful to people who tend to procrastinate. The app only tracks time when it detects a certain set of keywords in a document, or in an URL or app title. You define these keywords when you start to use the app and can add new keywords at any time. For example, if you've added the keyword "time tracking" into your list, Qbserve will automatically track time spent on web pages and apps with this keyword in the title. That way, if you use YouTube to watch videos about time tracking, it'll be counted into your billable hours. On the other hand, if you watch cat videos, this time won't be counted into your billable hours. Qbserve is an app for individual users and freelancers who tend to get distracted often - one moment you're researching something for your work task, then end up watching cute cat videos on YouTube. At the end of the day, you therefore have no idea how much time the certain task has taken. In such cases, Qbserver can help. Time tracking based on keywords. The perfect and simple time tracking app and productivity monitoring software to help keep track of daily browsing habits and finding productivity killers. Apart from the tongue-twisting name, there is no possibility to track the time spent offline on meetings or calls, the app only tracks the time spent working online. $35 one time payment per user. Did we help you find the time tracking software that fits your needs? Great! And if that productivity tracker you chose is DeskTime, you can sign up for a free trial right here. 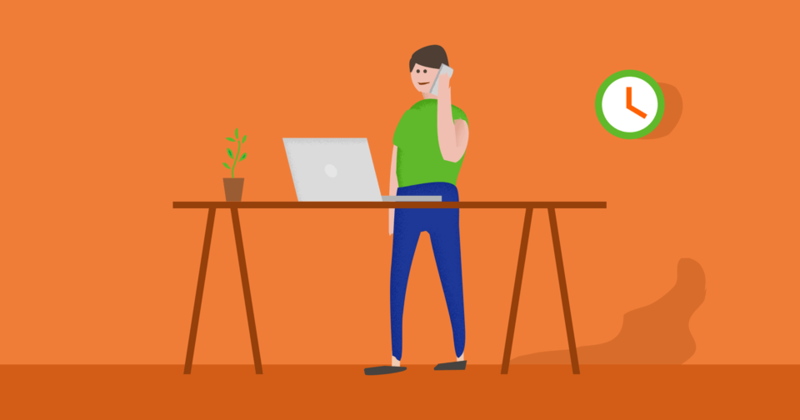 Start tracking your employees' time with DeskTime! The time tracking software that over 6.7k employers love and 144k employees don't mind using.